Selecting a Wooden Shed for an Integrated Remediation System is desirable for sites where the system is in public view. Shed systems can be painted to blend with existing architecture and outfitted with sound attenuation to minimize visual and noise impacts associated with equipment operation. Shed Systems are available in various sizes and stamped engineering drawings are available upon request. Standard sheds feature wood construction, sound insulation, UL listed controls, and fully integrated mechanical and electrical components. The shed is built on a steel base frame to ensure stability during transportation. Shed blends with existing surroundings. 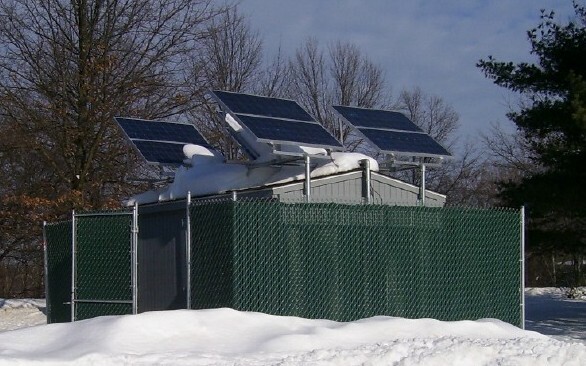 Shed outfitted with solar panels.